1. A casual workout at the Ng Family Academy. 6. Sifu Ng adjusts Annabelle's sau-chue. 2. A casual workout at the Ng Family Academy. 7. Giving a demo with the child members of the Ng Family Chinese Martial Arts Academy. 3. A little chi-sao sparring. 8. More photos from the demo. 4. 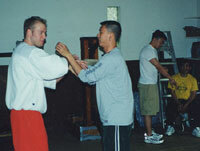 Instructor Keith Voney and Instructor Ken Lee engage in a little chi-sao practice. 9. 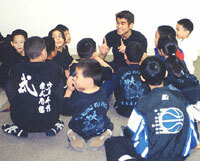 Sifu Phil talking to the kids back at the academy after the demo. 5.Annabelle working on a few techniques with Sifu Ng during a visit. 10. 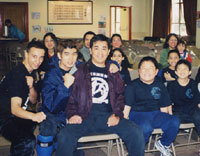 Sifu Sam Ng (center) with his students.